The Oceanside real estate market is very diverse. Along the coast are multi-million dollar oceanfront mansions and condos used for both as homes and as vacation rentals. Downtown Oceanside, once known primarily as a military town due to the close proximity to Camp Pendleton, is in the process of reinventing itself with several redevelopment areas. Rancho Del Oro is a planned community located along College blvd between Highway 76 and Oceanside Blvd. Arrowood, home to Arrowood Golf Course, is a newly developed area of homes surrounding the golf course in the northeast section of Oceanside. Fire Mountain, located between El Camino Real, I-5, Highway 78, and Oceanside Boulevard., is one of Oceanside’s most distinct areas and can best be described as eclectic with many styles and sizes of homes, many with ocean views, located among winding, hilly streets. Oceanside is one of the last coastal communities in Southern California with affordable housing. According to Trulia.com the current median sales price for Oceanside real estate for the period of October 2012 through December of 2012 was $325,000 which is considerable lower than any of the other coastal communities in either Orange or San Diego counties. If you dream of living near the coast you will certainly get more for your money in Oceanside than in any other coastal community in Southern California. Oceanside, CA is the northern most city in San Diego, County conveniently located 35 miles north of Downtown San Diego and 83 miles south of Los Angeles. Oceanside is adjacent to Camp Pendleton, the major West Coast base of the United States Marine Corps. Oceanside offers year-round temperate weather and easy access to all of Southern California’s attractions. Residents of Oceanside enjoy three and a half miles of beaches and a 1,000 boat slip harbor. 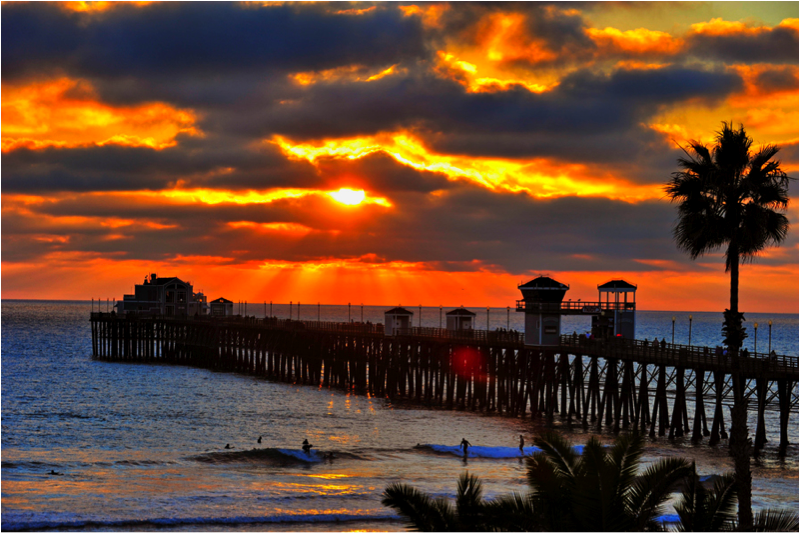 Additionally, Oceanside is the home of the longest wooden pier in the western United States. The wooden pier, first built in 1888, is 1,954 feet long. At the end of the pier, over 1/3 of a mile off the coast of California, is a Ruby’s Diner. Locals and Tourists alike can dine and watch surfers or magnificent sunsets from one of the best vantage points in Southern California. The area that is now Oceanside was originally inhabited by Native Americans. Spanish missionaries under Father Junipero Serra founded Mission San Luis Rey de Francia on a former site of a Luiseño Indian village on the banks of the San Luis Rey River on June 3, 1798. Mission San Luis Rey, the largest of the California Missions, still stands to this day and is considered a National Historic Landmark.